We started off with some drinks – all the other previous times we were so busy stuffing our faces that we always forgot the liquids. 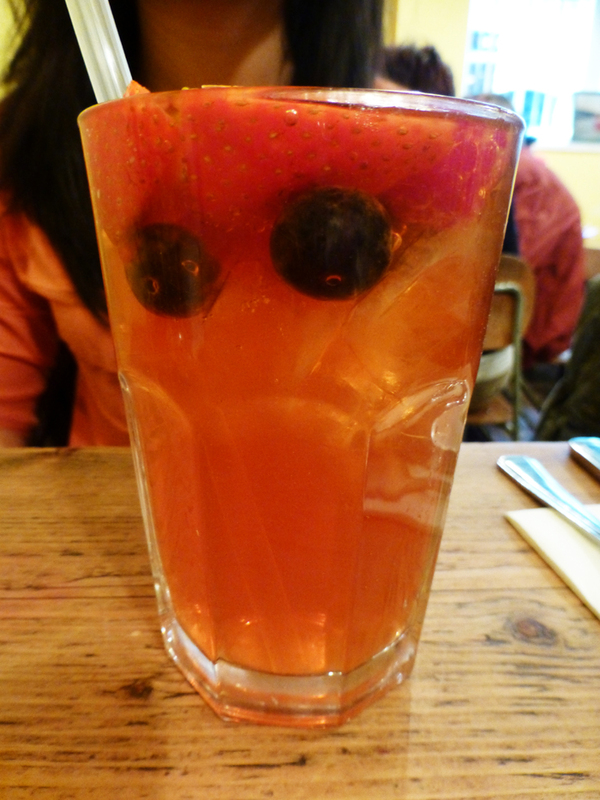 My friend ordered a Blue Monday (£4.30) – a smoothie made with blueberries, strawberries, and apples. It was surprisingly light and refreshing, which was probably good considering we were going to eat a heavy meal. 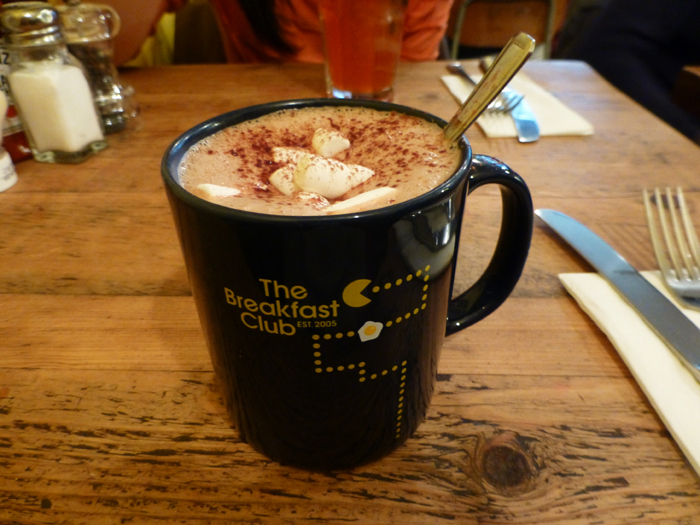 I ordered the hot chocolate (£3), which was thankfully not watered down. It came in an adorable cup, and I was afraid that I would finish it before my food even arrived. I love the addition of real marshmallows, but I feel that the hot chocolate, as with all the drinks on the menu, was on the expensive side. To share, my friend and I first ordered The All American (£10). 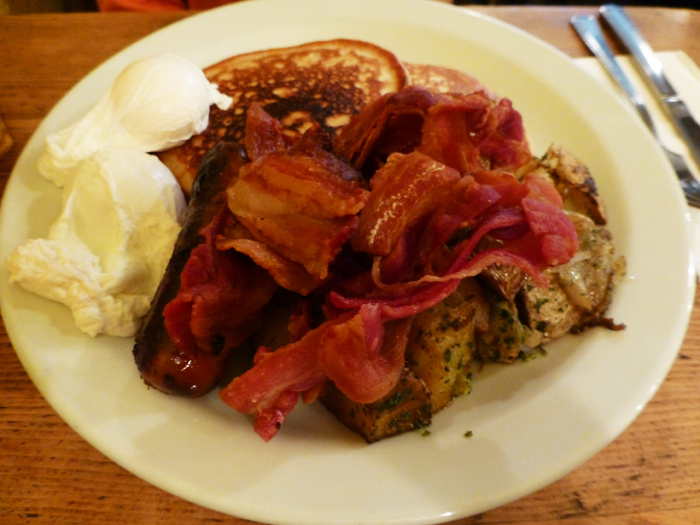 It comes with 2 pancakes, 2 eggs (we asked for poached), 2 sausages, home-style fried potatoes, and bacon. It was classic diner food, except executed much better. The eggs were a bit inconsistent, though: mine was perfectly runny while my friend’s had solidified. The flavor of the spicy sausages, fatty bacon, and sweet pancakes ended up mixing on our plates as we ate, but we didn’t care. 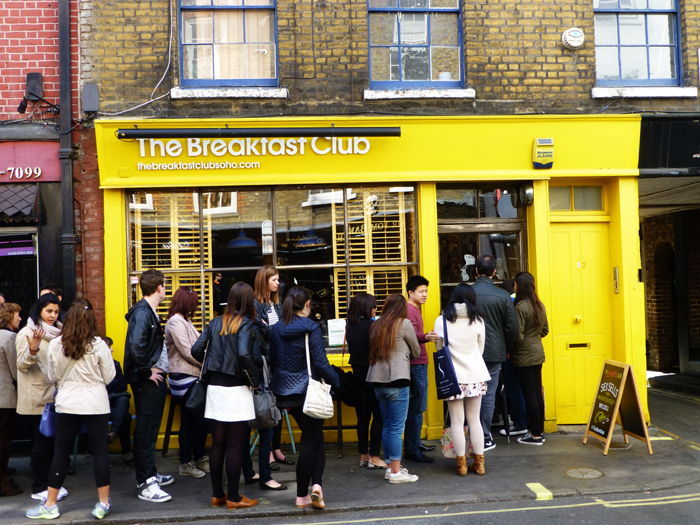 Our excuse is always, “We’ll be walking it off later.” I’m also particularly biased towards their home-fries. 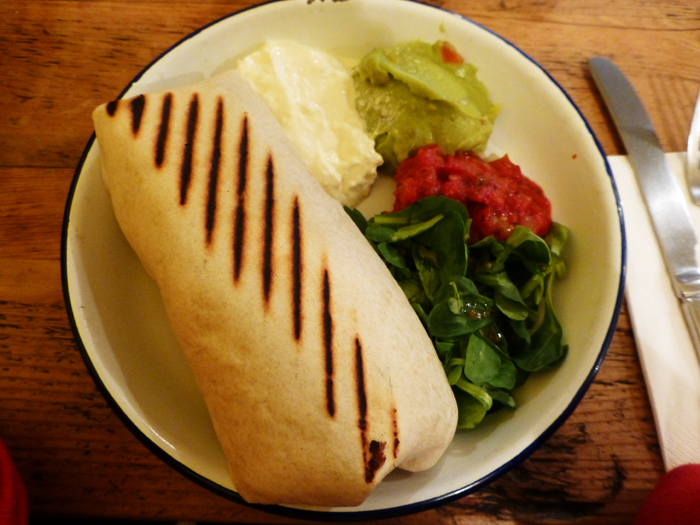 We also ordered the Breakfast Burrito (£9), and it was massive. Stuffed with chorizo, scrambled egg, roasted peppers, and Portobello mushrooms, the burrito looked as if it would explode upon cutting. On the side, there was also generous amounts of sour cream, guacamole, and a spicy salsa. The burrito itself was actually too spicy for me – I’m a wimp when it comes to any form of spice – but it was so delicious that I just let my mouth burn. After eating just half and before I had even started on my portion of the All American, I was already starting to get full. If I had to choose, I would say that the pancakes at The Breakfast Club are still the best – whether you get them savory or sweet. But there are still a ton of other great options on the menu. Trust me, though, definitely bring at least one friend if you go because, like me, you’ll want to convince them to share with you.